Skid Row is no place for a child. 'Home' to the homeless and a haven for alcoholics, it's an area of downtown Los Angeles where drug use and prostitution is rife. For Daniel Edozie, 'home' is exactly what it was and only one thing got him through - "instinct". Edozie's instinct got him through hotels, motels, shelters and the streets. He begged and borrowed just to survive. He saw things no child should ever see. Eleven years after his experiences 'panhandling' and 'bus-hopping', Edozie, 23, now finds himself in the tranquil surroundings of the West Country where he is plying his trade for Bristol Flyers in the British Basketball League. "There are a lot of things I experienced that I never should have gone through but I never gave into the situation as a kid," Edozie tells BBC Radio Bristol. "I was very instinctive as a kid and I used my instinct to survive. I learned to survive on my own as a 12-year-old. I was a 12-year-old man." While some may feel embarrassment at sharing such a story, Edozie feels no shame. He is proud of where he has come from and what he has achieved. Others may choose to erase the horror from their memory, but not Edozie. "I remember it like it was yesterday," he said. He hopes his story can act as inspiration and others follow his mantra: "No matter what battle you face you have to find a way to get over the obstacle." In 2004, aged 11, London-born Edozie and his mother Georgina crossed the Atlantic and headed to the United States looking for a better life. It did not emerge. They were homeless after a day and they soon returned to the UK. Two months later they were back in the States with what Edozie calls "a much better plan". It was a plan that failed and the pair again found themselves on the streets, alone and vulnerable. "That's when we went through the entire journey of hardships, being homeless, sleeping on buses and trains," he explains. A 2,700-mile, three-day bus journey from Boston to Las Vegas followed. Edozie's head was spinning. "We were staying in an apartment for a few months and then after that apartment, we started facing all the hardships again. We went from shelters, to a hotel, to the streets, back to the shelters. I was always questioning why I was going through these things." With an expired 30-day visa, Edozie and his mother were also now effectively staying in the country illegally. They were kicked out of yet another shelter "which felt like a family". There was another night "crying" on a bus-stop bench, which Edozie describes as his lowest point. After a stint sleeping on a floor with grown men at the Salvation Army, a new journey beckoned, this time to Los Angeles. Known as the place in downtown LA where the homeless have hit rock bottom, it is where Edozie went to live. In and out of shelters such as Union Rescue Mission and Restoration Foundation, it was where he called home. "We had it tough there, it was another adjustment," he reveals. Who are the homeless of Skid Row? "Staying in that society really opened my eyes as a kid. It made me think, 'this is not where I want to be'." Despite his situation, Edozie managed to somehow attend school - Hollenbeck Middle. Outside of lessons he would panhandle (beg). He remembers using the money to ride on public transport at night in order to sleep. "I begged to survive, asking for money from a stranger. I knew how to play the innocent role," he said. And, despite his environment, the 6ft 8ins power forward never felt in danger. The only danger he experienced was temptation. "I never sensed any kind of violence coming towards me, although there were a few times where temptation came in and I had the opportunity to go down the wrong road but chose not to," he added. Being separated from his mother was not a new experience for a young Edozie, who learned to survive on his own. "Being a man at 12 years old is a lot to take in," he admits. "You have to look for opportunities to survive." He would often be separated for days at a time as his mother went in pursuit of money or shelter in San Fernando, California. However, one particular parting changed his life forever. After a disagreement with his mother, Edozie went to a Salvation Army shelter for some food. When he left, she was gone and he found himself wandering the alleyways of downtown LA. He said: "One day I ran into a group of people and asked for some help and they were like 'wow, you're too young to be out here on your own'." With no shelters in Hollywood willing to take him in, they eventually called the police. "That was the turning point," he says. "I didn't know I was in the foster system until the next day. That's when I finally found what I needed." Edozie remembers the oddest details of that day, being picked up by a "tall, light skinned man with a perm" in "a new white Mercedes coupe with leather interior". It made him smile, it was the type of smile he says he had never experienced before. He was now in the care of the Department of Children and Family Services and in July 2005 would eventually meet foster mother Faye Brim via 'Wings of Refuge'. She would raise him in Compton, California, through to high-school graduation. It was not an easy process and he faced deportation in 2006. He stayed but his mother was eventually sent back to London. Basketball has given Edozie the opportunity of a life that would have been unimaginable 11 years ago. 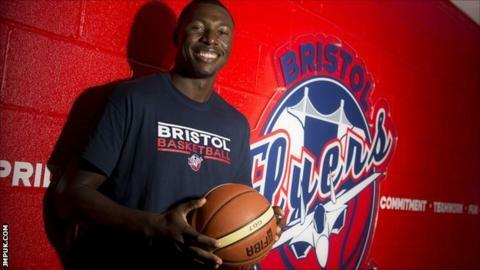 He finds himself at Bristol Flyers via Iowa State Cyclones - where he also earned a degree. He joined the Cylones after transferring from Tyler Junior College in Texas - where a clip on YouTube reportedly convinced coach Mike Marquis to offer a place to Edozie. Prior to that, persistence saw him join Compton Centennial High School in California as a junior. Having had an initial interest in American Football as a high school freshman, his attention turned to basketball and it was at Centennial that his talent was allowed to flourish. According to an article on sportsillustrated.com, it is described as one of California's top 10 teams. His talent was raw, his conditioning poor, but under the guidance of coach Vadim Malikin he rapidly improved. "Every obstacle, I've found a way to overcome," says Edozie. His frame, power and potential impressed Marquis and he soon found himself in Texas playing college basketball. University followed. So what is next for Edozie on his epic journey? After a deprived childhood he wants to have some fun, but he also has a more serious side. He wants to make a difference, hoping to become a lawyer and campaign for child advocacy. There are also plans for a book. His story is incredible, but it is far from finished. "I want to go to other places, share my experiences, inspire people, have fun, be young," he says.